I know this recipe is for a specific cook, but I still think it’s worth sharing! When I say specific cook I mean….you have to have access to sourdough starter to even think about making this recipe. My apologies to those who don’t have starter! To those of you who do, I hope you enjoy this delicious breakfast item that has become a staple in the Fillmore house! I’ve talked about sourdough before on here, and why it’s so good for you. I won’t do it again! If you want to read about it go here. I told you all about it when I shared my sourdough bread recipe. I love these pancakes! My kids love them too! My son asks for pancakes every morning and even is learning the ingredient list! I sit the bowl of starter in front of him and he asks for an egg and a spoon so he can get it all started for me (or him…he’s pretty hungry in the mornings now that he’s 3). My kids will snack on the leftover pancakes throughout the day. It’s pretty nice actually! They aren’t crumbly like crackers and I feel like its a healthy snack for them with little to no added sugar and all the benefits of sourdough. It’s nice for me too! They are so filling, I’m not eating a bunch of food 30 minutes after breakfast because these aren’t just filling, but benefiting my health and wellness. Talk about a two-for-one deal! by Becca Fillmore, derived from all of the sourdough pancakes recipes I’ve ever read. Mix sourdough starter, butter, egg, salt, cinnamon, nutmeg, and honey in a mixing bowl. In a small separate bowl mix baking soda and water. 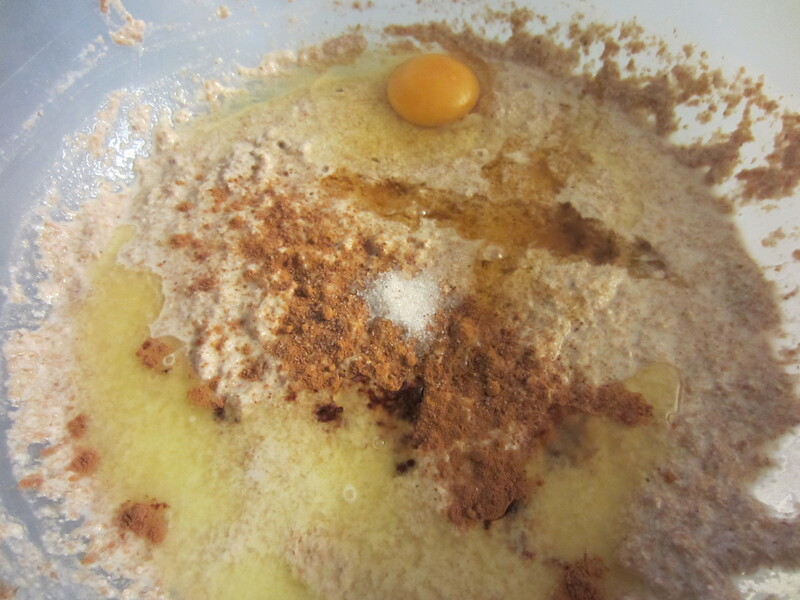 Add water/soda mixture in with sourdough mixture. Watch the mixture gain volume as you stir!!!! It’s pretty awesome if you ask me, plus it keeps the pancakes nice and fluffy. Pour 1/4 cup of batter preheated pan. Cook until the bottom is gold and bubbles have popped on top. Flip over and cook until done. *If you add honey the pancakes will be dark, no worries! If you opt out of the honey your pancakes will be a light brown, and not as sweet. I have been omitting the honey for a while now and non of us seem to notice the difference!